Shern was half-potty trained since about a year ago. I said 'half potty-trained' because Shern is potty trained only when he is awake, not when he is asleep. Shern takes one afternoon nap during the day time, for about 1 1/2 - 2 hours, and about 10 hours sleep throughout the night. Earlier on, I was too lazy to potty-train him while he was sleeping, because I was afraid of him wetting the bed, and spoiled the mattress. I did let him use a wet-pad which I slipped underneath the bedsheets. 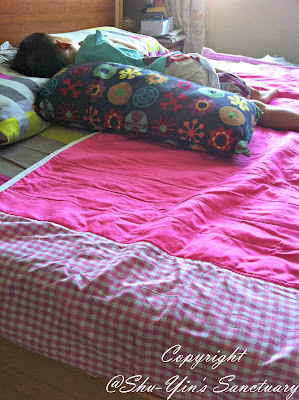 But when he wets the bed, I need to change the bedsheets, and that is so troublesome. I got lazy doing that after a while and I tossed the wet-pad aside. 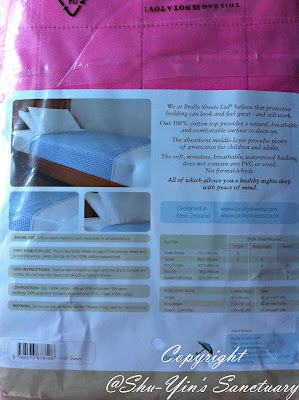 So when I was being sent a piece of Queen-sized Brolly Sheet for review by Tamy from SMT Distributors, I was ecstatic. So what are Brolly Sheets? 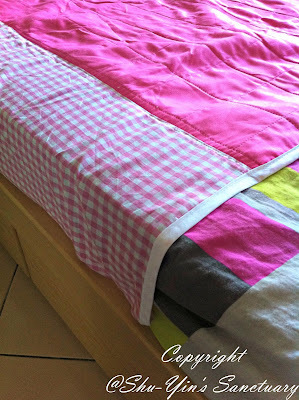 Brolly Sheets are a simple, discreet & stylish solution to wet beds! It is a waterproof sheet protector with a 100% cotton top sheet with a waterproof backing that protects the mattress/bed, and also the bed sheets from getting wet. 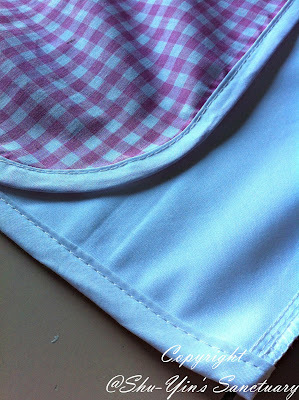 The pink colour is the 100% cotton top layer. 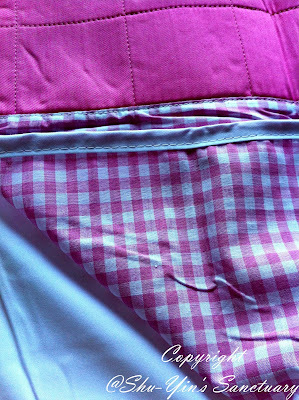 The pink and white check is the side wings, and the white layer is the breathable and quiet PUL waterproof backing. 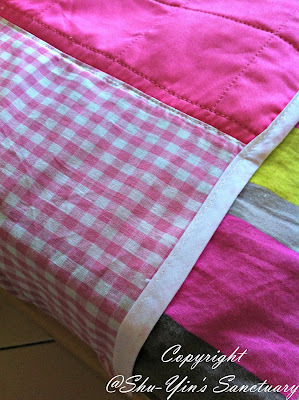 There are little side wings which tuck in at the sides of the mattress/bed, which keeps the Brolly Sheet in place. 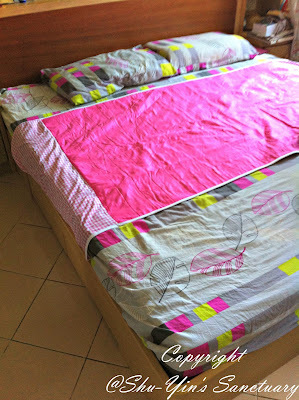 With these Brolly Sheets, there is no need to strip the entire bed, when Shern wets the bed. 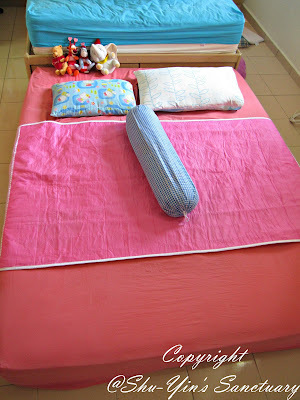 It is only the Brolly Sheet that gets wet, so I don’t have to change the whole bed. It is brilliant actually, the design is so simple, and yet so practical. It saves my time, and it protects my mattress AND the bedsheets. Now the problem is although Shern sleeps on the queen-sized mattress at home, but when he goes over to Pho-pho's house (who lives just at the next block) during the afternoons, he sleeps on Pho-pho's king-sized bed. I brought it over to try, and to my surprise and delight, it kinda fits too. The side-wings are long and generous enough even to tuck below the king-sized bed. And it helps that Pho-pho's king-sized bed is the super heavy coconut husks mattress, and thus the weight keeps the side wings down. I'm happy with the generous-sized side wings, which allows it to be tucked underneath even on a king-sized bed. The generous sized side wings keeps the Brolly Sheet in place so well that even though Shern is a wriggly sleeper, it doesn't go out of place. 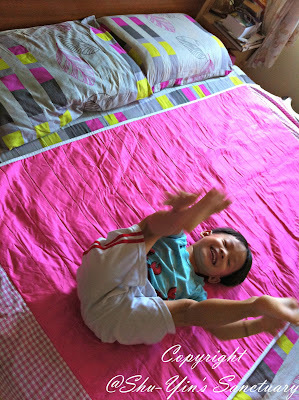 Look at Shern playing and goofing around on the bed. At last, peace and quiet when he is asleep. 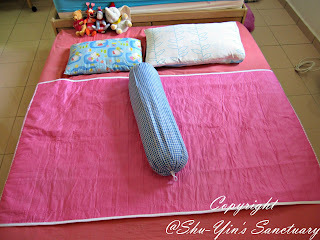 But back at home, the Brolly Sheet fits perfectly on a queen-sized mattress we put on the floor for Shern. The side wings are being tucked properly at the sides just at the right angles, at the edge of the mattress. I started letting Shern take his afternoon naps without wearing diapers. I told him that he needs to wake up if he wants to pee. On most afternoons, he sleeps though the short 1 1/2 - 2 hours nap without the need to get up and pee. But there was twice that he forgot and peed on the Brolly Sheets. He woke up and told me that he peed on the bed. I quickly changed his clothes and when I removed the Brolly Sheet to check my mattress, it was completely dry (yay! 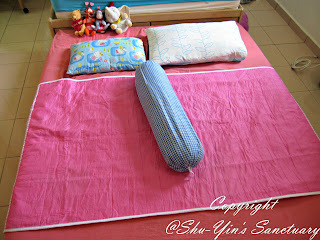 ), and Shern is a very heavy bed-wetter indeed. I was impressed! 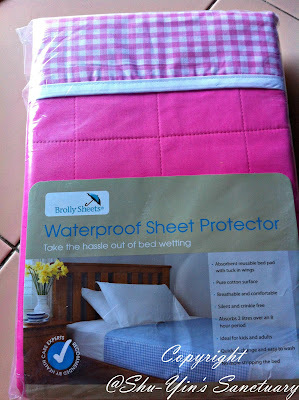 I forgot to mention that this marvelous Brolly Sheets can hold up to 2 litres of water! 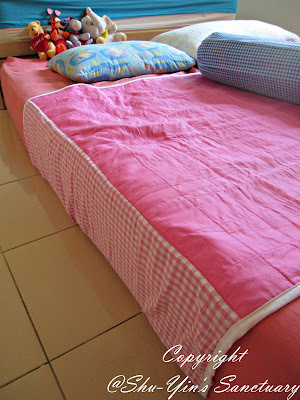 I was so happy I did not have to change the bedsheets nor worry that I might spoil the mattress. However, when I took it for a pre-wash and also when Shern wetted the Brolly Sheet, it took quite awhile to dry on the clothes line. If there is no sun, it needs more than a day to air-dry it on the balcony. But when there is enough sun, it dries up after one day on the clothes line. So drying time can be a little long, which I think is due to the fact that it can retain water in the PUL layer. But if you have a dryer at home, then this won't be a problem for you, because Brolly Sheets can be dried in the dryer as well. And also I feel that I need more than one piece of Brolly Sheet because after Shern wet the bed, then I would need another one to replace the wet piece. So I would say two Brolly Sheets would be better for me for effective potty-training during sleep. But overall, I am super happy with this Brolly Sheet. It gives not only Shern the courage to nap without the diaper, thus initiating the difficult part of the potty-training, but it also gives mummy (me!) the peace of mind when Shern goes diaper-less! I'm definitely going to buy another Brolly Sheet to use when the other is drying on the clothes line. Hopefully, in just awhile, I will continue to use this Brolly Sheet to train him to go diaper-less even at night. You can purchase the Brolly Sheets online at SMT Distributors or walk-in at any of their Singapore, Hong Kong, China, and Philippine stockists. Thanks to SMT Distributor, you get 10% off Online Purchases for Brolly Sheets. 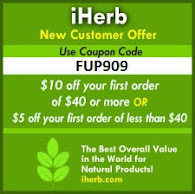 Just key in the Discount Code 'A003' and click 'Apply Coupon' upon check out, and you are good to go. This promotion is valid until 1st July 2013. For more info, please visit SMT Distributor's website or their Facebook page. * Disclosure: I received a queen-sized Brolly Sheet for review purpose, but no monetary incentive was received. All text and opinions are of my own and represents my honest opinion of the product(s). Will it hot when sleeping on top of the Brolly sheet? Nope, the top part is made of 100% cotton. so totally wont feel hot!